A row of poorhouses was situated in North Skirlaugh as shown on the 1855 map below. North Skirlaugh poorhouses site, 1855. Some poorhouses also stood at the west of Withernwick on what is now West Lambwath Road. Dunnington had a number of poorhouses including two rows at the south of the village. There was also a poorhouse on Elvington Road at Grimston. East Riding of Yorkshire: Atwick, Skirlington, and Arram; Aldborough, Benningholme and Grange, Bewholme and Nunkeeling, Bilton, Bonwick, Brandsburton, Catfoss, Catwick, Coniston, Great and Little Cowdon, Danthorp, Dunnington, Ellerby, Elstronwick, Fitling, Flinton, Ganstead, Garton with Grimston, Goxhill, Great Hatfield, Little Hatfield, Hempholme, Hornsea with Burton, Humbleton, Lelley, Mappleton and Rowlston, Marton, Moor Town, East Newton, West Newton with Burton Constable, Rise, Long Riston, Seaton and Wassand, Sigglesthorne; North Skirlaugh, Rowton, and part of Arnold; South Skirlaugh, Sproatley, Swine, Thirtleby, Withernwick, Wyton. The population falling within the union at the 1831 census had been 8,288 with townships ranging in size from Bonwick (population 22) to Aldborough (813). The average annual poor-rate expenditure for the period 1834-6 had been £5,096 or 12s.4d. per head of the population. Skirlaugh Union workhouse was erected in 1838-9 at the west side of the main road running north-west from South Skirlaugh. Its construction cost of £2,332 and it accommodated around 60 inmates. The building was designed by John and William Atkinson of York who were responsible for a number of other Yorkshire workhouses including Bedale, Beverley, Easingwold, Guisborough, Goole, Howden, Pocklington and York. The site is shown on the 1910 map below. The layout of Skirlaugh was a little unusual and was somewhat reminiscent of Sir Francis Head's model courtyard plan adopted by some Kent unions in the 1830s. A rectangle of buildings, with an entrance block at the east, enclosed a large central courtyard. The courtyard was divided by a central partition between male and female sides, with each side further subdivided into two yards, perhaps one for the able-bodied and one for the elderly and infirm. Skirlaugh main block from the east, 2001. Skirlaugh main block from the north-east, 2001. The workhouse closed in 1915, with the children and few remaining inmates being removed to Beverley. The workhouse became a military hospital in 1916, then was taken over by the local council in 1922. The building was then converted to housing known as Rowton Villas. The buildings were later used as offices by Holderness Borough Council (now the East Riding of Yorkshire Council). 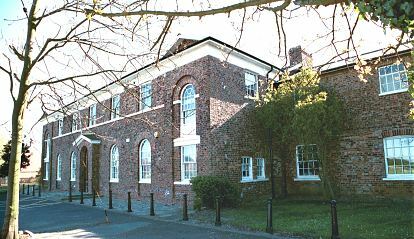 East Riding of Yorkshire Archives and Local Studies, The Treasure House, Champney Road, Beverley HU17 9BA . Holdings include: Guardians' minute books (1836-1930); Ledgers (1836-1930); Visiting committee minutes (1896-1908); etc.